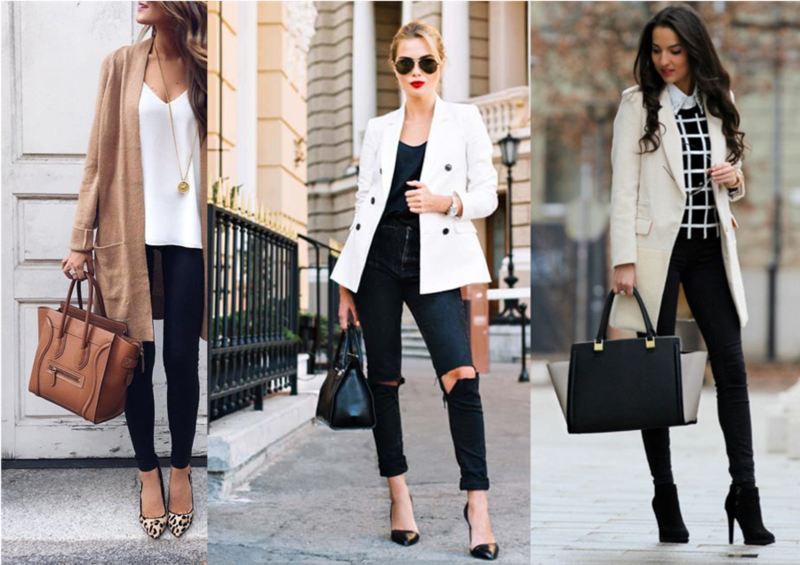 I totally love black jeans, they are so versatile! You can easily dress them up or down. As I have mentioned before the darker the jeans the more dressy the outfit will look, however, even if dark, ripped jeans will always be more casual. These are outfits I wore last week and a while ago. I am wearing the same jeans in both photos, the light just makes the colour look different. Remember that even if you have heard that wide legs are better for you, I don't agree. Straight to slim legs are the more versatile and appropriate for all body shapes. And also more stylish. A more fitted leg creates a vertical influence, and that is always more slimming. I am all for adding colour, so you can see here a more colourful top and wedges that make my outfit more casual, and on the right red accessories and all black, looking a bit more dressy. On the photos below you can get some more ideas on how much you can do with black jeans. The photo on the right is the more casual and the one on the left the most dressy. Since the bottoms are black, you can add a lot of contrast and pattern to your tops or accessories. Just remember that black minimises and white and pale colours and pattern will emphasise. Now it's your turn. Are you a denim lover? Do you own black and dark jeans? I love asking myself these questions constantly. Then checking my wardrobe to make sure that I own pieces that represent me and my unique style. Are you joining me for WALKING TALL? Are you ready to create a Stand out Image and Personal Brand. What impression do you want to bring to people's mind when they hear your name? In just 3 hours I will unearth the secrets to developing a stand out personal brand. These actionable tools will propel your business or career to the next level. Read more here.